Do you love the Deli-Style Marinated Mushrooms at the Antipasto Bars? 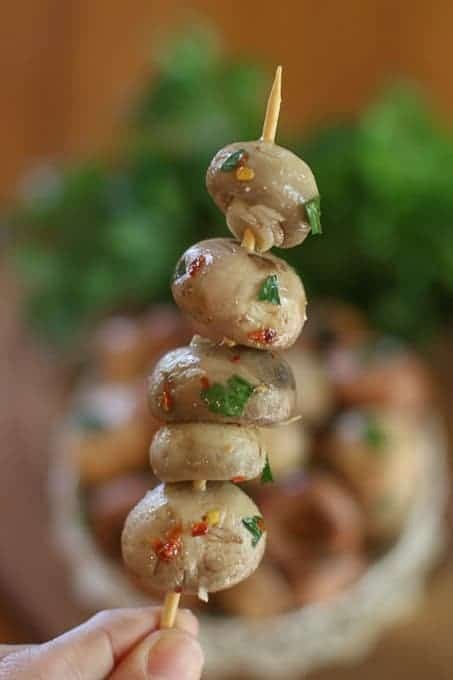 Then you will love this 10 Minute Easy Italian Marinated Mushrooms Recipe! Do you love the Deli-Style Marinated Mushrooms at the Antipasto Bars? 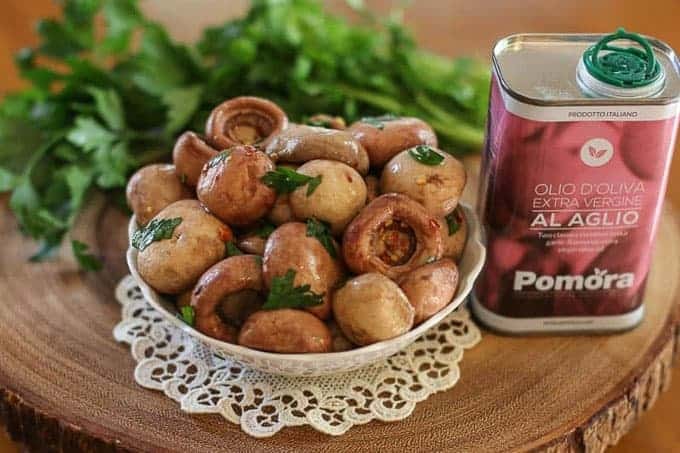 Then you will love this 10 Minute Easy Italian Marinated Mushrooms Recipe! Make your own at a fraction of the price. 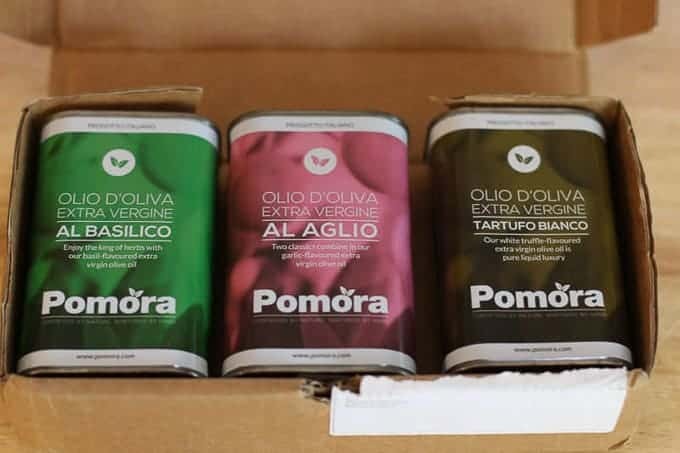 With Pomora, you adopt an olive tree from their beautiful Olive Groves in Italy. You will then receive an Adoption Pack with a certificate showing your tree and a booklet of information about your tree. Quarterly you will receive a shipment of 3x250ml tins of oil from your tree alternating between gourmet selection of a plain oil quarter and a flavored oil quarter. Pretty cool? Yes? Their Fall Collection consists of a basil, garlic, and white truffle infused olive oil assortment. I have tried every one and they are all fantastic! I used the garlic infused olive oil for this recipe, and I will use the white truffle olive oil on my parmesan crusted potato wedges I will be making for dinner tonight… I am drooling thinking about it. I LOVE the marinated mushrooms at the Antipasto Bars you find at the grocery stores. They are so expensive though. I usually see the Antipasto Bars priced at $10.99 a pound. If I am lucky, I come across one at $8.99 a pound. Those little mushrooms quickly add up in weight. So I thought to myself, why not make my own deli-style marinated mushrooms? 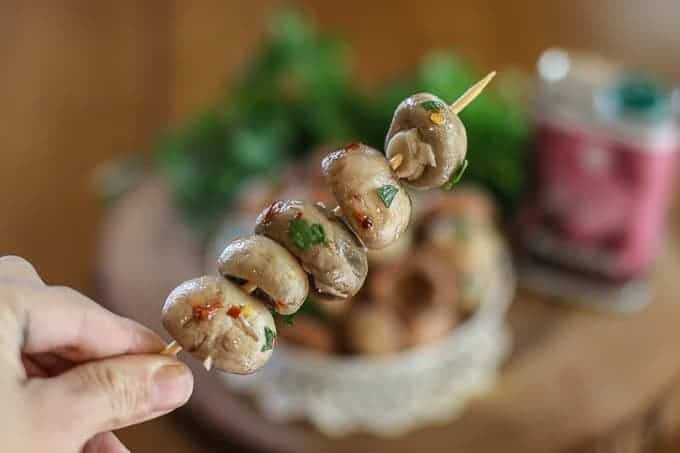 These 10 Minute Easy Italian Marinated Mushrooms are so easy to make and quite frankly better tasting than the ones you find in the deli! You can make as much as you want at a fraction of the cost. Clean the mushrooms really well. Cook them in the vinegar/water combination. Toss them in olive oil and seasonings. Chill and serve when ready! If you like this recipe, check out: Cuban Sandwich on a Stick, Fire and Ice Pickles, and Asparagus and Roast Beef Rollups. *I remove my stems. You don’t have to. If you remove your stems, you can use them in a broth or freeze them for a later use. *If you only have the plain Extra Virgin Pomora Olive Oil, you can just add 1 crushed garlic clove. In a pot, bring vinegar and water to a boil. Cook mushrooms for about 5 minutes or until mushrooms shrink in size and have softened. Drain mushrooms from any extra vinegar mixture. 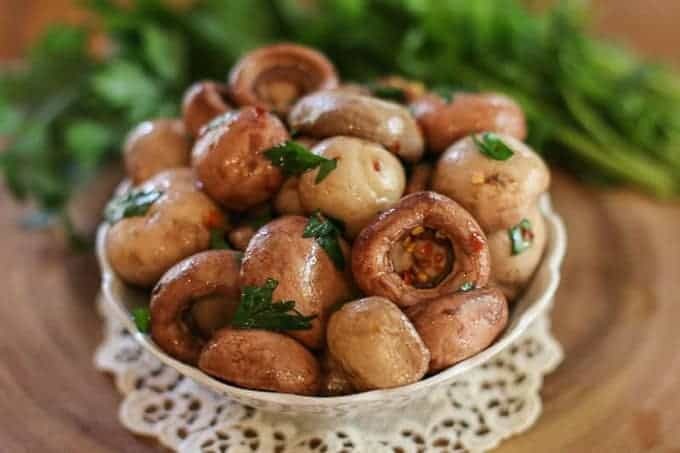 Mix mushrooms with salt, red pepper flakes, Pomora Garlic Olive Oil, and parsley. Serve immediately or refrigerate in a sealed container until ready to eat. I am so glad you and your guests loved the mushrooms. Thank you for sharing. You made my day! I used your recipe for two antipasti I made over the holidays. Every one thaught I had spent a lot of money to serve Bowles of your mushroom. Thank you for making me look good! Thank you Gwen! I hope you enjoy them!! Thanks so much! I found mushrooms on sale yesterday. I really LOVE the olive bar version. Thanks for the recommendation and recipe.